Our product range includes a wide range of ceramic fibre cloth. Ceramic Fibre Cloth is a woven fabric that is manufactured from high purity alumino-silicate based ceramic fiber, reinforced with fiberglass filament and optional alloy steel wire. 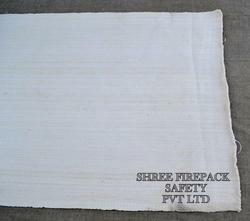 The Ceramic Fibre Cloth product is white and odorless, suitable for high temperature applications up to 2300°F. Looking for Ceramic Fibre Cloth ?